Searing is to cook something hot and fast to brown the surface and to seal in the juices. Searing is a process of cooking that creates the crusty surface texture most people find appealing and the caramelized sugars that give us that steak flavor we want. 1. Marinate steak for 10 minutes at room temperature. 2. Mix all butter ingredients in a food processor and blend until smooth. 3. Roll on to wax paper or plastic wrap and form a cylinder. Chill until firm. Sear steak in hot plate for 2 minutes per side. Once you flit it over the first time, place 20g of the compound butter on steak. 4. 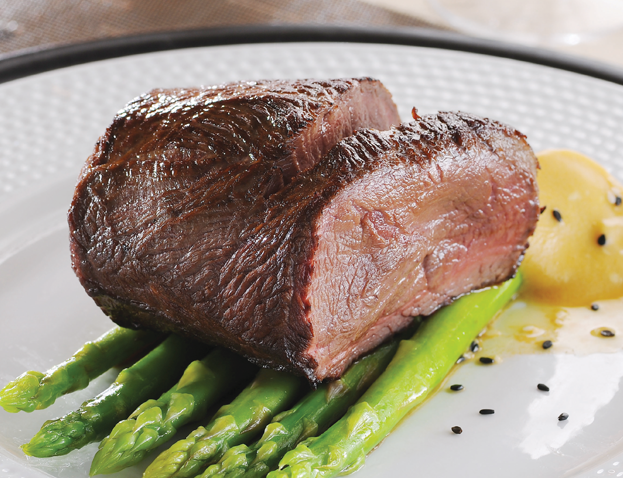 Serve on warm plate with a side of butter sautéed asparagus. Enjoy!